Welcome to the OM Yoga Travel Guide 2019. Everyone loves a good holiday and what better way to spend your time than rolling out your mat on your travels. Yoga holidays are a great way to grow your practice or just have a bit of extra fun while you’re away…so pack your bags and prepare for departure. 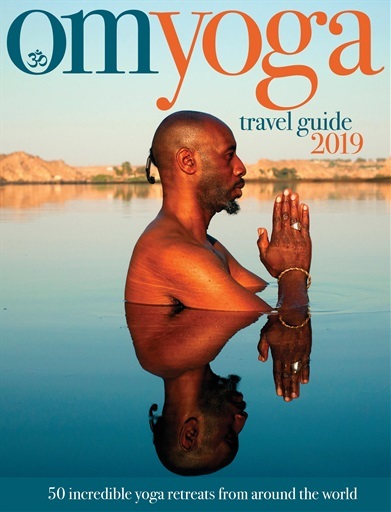 Inside this special OM travel report we’ve selected dozens of incredible retreat destinations where you can unwind and rediscover your zen. It’s time to head off on the retreat of a lifetime. There are plenty of yoga choices wherever you are in the world. We’ve split this report into four distinct geographies: UK & Ireland; Europe; Asia; and the Rest of the World. Wherever you find yourself you’ll enjoy plenty of time on the mat, and some of the best and most inspirational teachers out there. Pick a yoga style you love, or head out to an exotic island you’ve always wanted to visit. There’s so much choice available. Find your bliss on a weekend wellbeing retreat close to home or splash out on the holiday of a lifetime to rediscover your bliss in an exotic paradise. Or maybe explore incredible India, yoga’s ancient birthplace. Whatever your plans, wherever you’re heading, we’ve got something inside that’s just right for you. You’ll got a lot more than yoga on your travels too: dine on delicious food with new friends, enjoy nutritious juices and smoothies, or take time to relax, whether that’s by the infinity pool watching a dreamy sunset, or on a long back-to-nature hike through the countryside. Any yoga retreat is nourishing for the soul, so whatever option you pick you’re sure to have a happy, healthy, fun time. It’s also an experience that can change your life forever. So what are you waiting for? If you’ve never been on a yoga break before, now’s the time. It’ll be the best thing you’ve ever done and your body will love you for it.